The Philips Brilliance 64 mobile CT scanner combines remarkable image quality with speed, ensuring that users in fast-paced clinical environments can achieve detailed pictures of any organ in just a few seconds. The resulting images, scanned in just a few seconds, are sharp, clear, and three-dimensional. In terms of scanning speeds, the Brilliance 64-slice CT scanner covers about 40 millimeters at a pass in about 0.4 seconds. A high-resolution of the heart, brain, or a pair of lungs takes about five seconds, while full body scans take about 30 seconds. The Philips Brilliance 64 mobile CT is highly regarded for cardiac, trauma, pediatric, pulmonary and oncological applications. Also, whether evaluating plaque within carotid arteries or searching for pulmonary emboli, this mobile CT scanner’s DoseWise technology aims to dramatically reduce dosage exposure without sacrificing high-definition image quality. 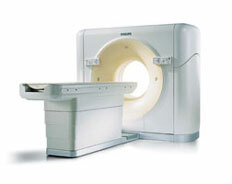 We recommend the used Philips Brilliance CT 64-channel for those needing the higher resolution and advanced CT capabilities. Many of our customers prefer the Philips CT scanners because of their ease-of-use, dose efficiency, and fast image reconstruction.